I am so over this winter. As is the rest of the population of North America. I'm grateful to be in Utah where I at least get some sunshine with my snow and sub-zero temperatures, but the crunchy, dirty old snow that envelopes my life is getting on my nerves. The giant icy perma-puddles inside of my garage, the skating rink that is my front porch because the gutters are blocked up with ice, the endless shoveling, treacherous driving, and the need to keep track of six people's worth of winter outerwear - all of it has lost it's novelty and any charm it may have had. I'm ready for some green-ness. But, since I'm not the one who controls the weather, all I can do is plan and hope and dream. Luckily, Janu-Feb is a perfect time to plan one's garden. And so as the seed catalogues trickled in, I squirelled them away until I needed them for my sanity. And when that need surfaced recently, I was armed and ready. It's so invigorating to think of garden produce, flowers, and mowing the lawn. Just the idea of being able to be outside without 20 minutes of prep-work makes me swoon. And you know what else has been super-fun? Sir O has taken this family-gardener-identity and run with it. I catch him sneaking the catalogues into bed with him. He begs for us to plant colorful peppers and carrots. It's downright adorable. It's also evidence that we are horrendous nerds. But I'm okay with that. 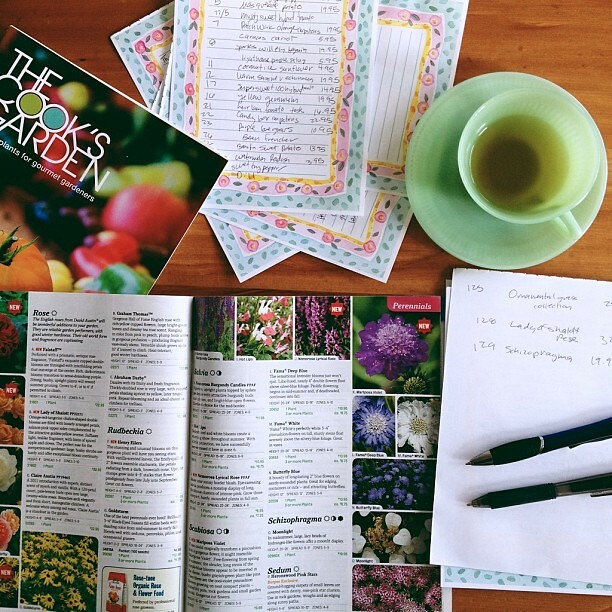 Now, to take my wish lists to the master gardener around here and see what makes the cut. We do, after all, only have so much dirt to work with.